Grantham hospital saved more than £196,000 since September with a trial at the Trauma and Orthopaedics centre. The service sees planned orthopaedic operations take place in Grantham, with each patient’s pre and post-op care maintained locally. Highlights also include delivering 30% fewer planned operations a week, which resulted in £196,000 savings per month. 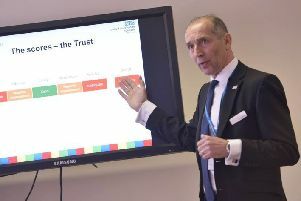 Mark Brassington, Chief Operating Officer at United Lincolnshire Hospital’s Trust, reported on the changes to the service to board members on Wednesday where he highlighted a rise in elective operations being carried out from 106 in October 2017, to 137 this year. Trauma and emergency care continues at Lincoln, Boston and Grantham, however a small number of trauma patients with a broken hip will be cared for at Lincoln and Boston instead of at Grantham. Mr Brassington said there had been a reduction in the number of cancellations due to having no beds from an average of 54 before the trial began to none in September and 1 in October. He said there had been a number of challenges, and tweaks included the loss of the Sunday trauma session and the modification of the Saturday session to include elective surgery with slots for trauma due to a lack of demand. Following the meeting Jody Clark, from Fighting for Grantham Hospitals, said: “It’s been quite telling that they’re had some challenges – it’s a big change to what it was before. It’s quite reassuring to hear the numbers for orthopaedic elective operations have increased massively from where they were before. The system will be reviewed in February.